We’ve all seen ‘http’ or ‘https’ at the beginning of a URL but what does it mean? Well, HTTP stands for Hyper Text Transfer Protocol and HTTPS is the same thing with ‘Secure’ added on the end. Essentially HTTPS uses a secure, encrypted connected and HTTP does not. A secure connection uses an SSL certificate to encrypt data and is particularly important if your site collects sensitive information such as passwords, personal data or credit card information. 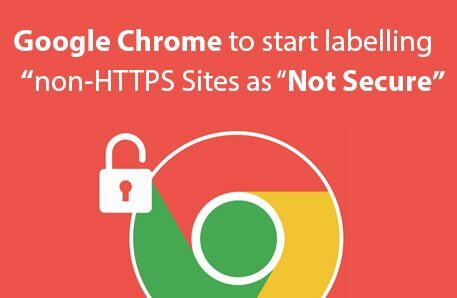 HTTPS is now particularly important for SEO since Google announced that it will start marking sites that don’t have HTTPS as ‘Not secure’ in Google Chrome. Users will get a red error message warning them that the site is not secure. This error is not something you want your users to experience as it may deter people from visit your site.Given that Chrome holds over 55% of the desktop and mobile browser market share, this means that this change is likely to impact your site. Aside from marking your site as ‘non-secure’, Google also confirmed that having an SSL encryption will give a site a slight ranking boost. If you want better rankings and don’t want your users put-off by a visible warning of an insecure connection then you should migrate your site over to HTTPS today. Do I need to change my hosting? When do I need to upgrade to https by? We strongly recommend upgrading as soon as possible. In October 2017, Google Chrome will start showing a 'Not Secure' message to visitors that navigate to your site. Chrome is one of the most widely used browsers today and therefore this will have a major impact. There are also many other advantages to upgrading so we recommending doing this today! What other services can One Egg offer us?